As far as a healthy relationship is concerned, there is so much that we can learn from both research and our own experiences of life. Most people today are confused about what to expect from a relationship, and the many ways to keep the spark alive. The truth is, there is no ‘one size fits all’ solution for every couple. Different people have to do different things to make things work. In this blog we will discuss some common habits that healthy couples have, although the specifics are up to every couple to fill in. Taking Interest: To keep the relationship healthy, it is important to take genuine interest in each other. This can be done in so many different ways, from asking how your partner is and sincerely listening to how their day went, to performing an activity together. Respect and acceptance: This means accepting your partner for who they are and treating them with upmost respect. 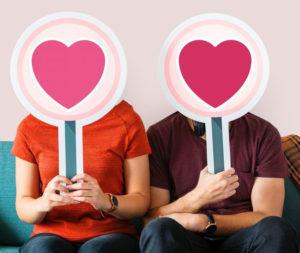 Once the honeymoon period is over, couples actually get to see the real side of each other (which may not always be positive). However, holding one another in a positive light is an extremely important practice to keep the relationship healthy. In addition, people who are in happy relationships also never talk ill about their partners in social situations. Meeting Basic Needs: Affection, companionship, and emotional support are some of the basic needs of any relationship. Happy couples are focused on making sure all these needs are met. They may even strive to take care of each other’s special needs, and are willing to grow. Positive Interactions: There is no room for negativity in a good relationship. Research proves that the most satisfying relationships are those where there are more positive communications than negative. There is no doubt that as long as the negative interactions are lower overall satisfaction will be high. Solve Problems: Regardless of how good a relationship is, there will always be times of conflicts and challenges. However, couples in healthy relationships figure out ways to decrease their arguments as much as they can. They also try to find solutions to their problems and sometimes even make compromises for each other. Rupture and repair: those in healthy relationships repair any damages done to their relationship effectively and quickly. This includes a) knowing that the partner is angry, hurt, or unhappy due to something, and b) tackling it to mend things timely. A lot of couples, waste time and wait for too long before mending the damages. A repair always begins with a sincere apology. Reciprocity: This means both the people in the relationship are working. If only one person is doing all the work such as, taking interest, respecting and accepting, meeting the partner’s needs, then it is likely that the relationship will not work for too long. In romantic relationships, it is always the little things that go a long way. An off-hand compliment, a small gift, a genuine kiss, can fortify a relationship and make it last a lifetime.